Eczema of the eyelids is a common condition that occurs around the eye area and can impact your day to day life. Luckily, eyelid eczema treatment is readily available. 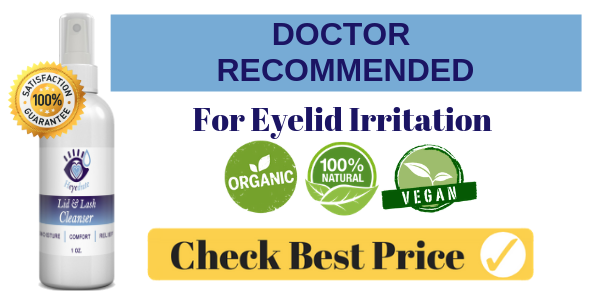 If you’re worried about needing to get a prescription from your doctor or enduring rigorous treatment, you probably will not have to resort to that, as there are many products available that can help you with your eyelid eczema. These include cleansers, creams, and sprays. 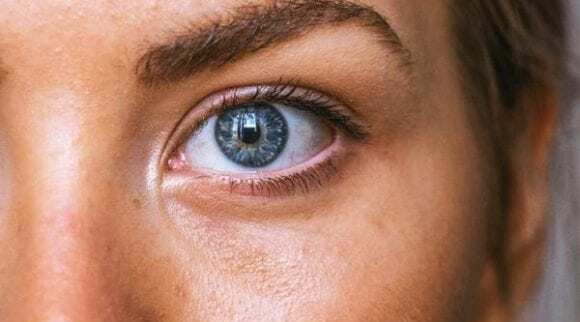 How can you be sure if you have eyelid eczema? If your eyelids are often swollen, itchy, red, or irritated, you may have eyelid eczema, a form of eyelid dermatitis. 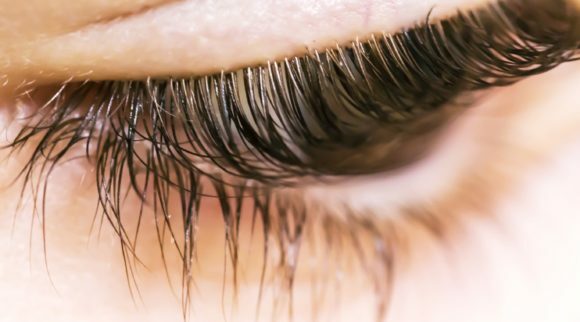 There are many forms of eyelid dermatitis, which is an umbrella term that indicates a group of inflammatory skin disorders that are located around the eyelids and resemble eczema. Eczema itself is a medical condition in which the skin becomes inflamed, and itchy and/or bleeding blisters form. Eyelid eczema is when this condition is located on your eyelids specifically. There are two main types of eyelid eczema: atopic (allergic) and irritant. Atopic eyelid eczema is caused by an allergic reaction, whether it’s to pollen in the air or to the metal of jewelry you wear. 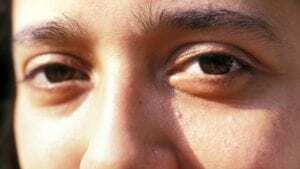 Irritant eyelid eczema develops when your eyes or eyelids come into contact with bacterial, fungal, or viral infections or foreign debris or objects that irritate and inflame the skin of the eye area. The skin around your eyes and on your eyelids is very delicate and thin. There is little fat to it, and these factors make your eyes and eyelids especially susceptible to allergic reactions and irritation. No matter what type of eyelid eczema you have, the condition typically causes a lot of irritation and discomfort, and flare ups may be difficult to deal with. Blisters, especially if they bleed and itch, are especially dangerous and irritable to the eye area. Once you confirm that you do indeed have eyelid eczema, it is imperative that you seek effective eyelid eczema treatment. Speak with your eye doctor to pin down the causes and symptoms of your condition and to discuss possible treatments and ultimately determine the best type of eyelid eczema treatment for you. Have symptoms on one or both eyelids. Experience chronic or occasional symptoms. Have infection around the eyelids alone or the surrounding area as well. Each of these symptoms will impact your eyelid area. If your eyes are burning and itching and you develop swelling or pain along your eyelids, you may have eyelid eczema. 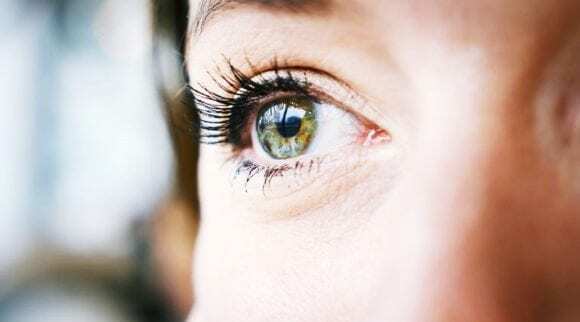 Eyelid eczema is caused by a multitude of factors, and sometimes your biggest challenge is figuring out what exactly is triggering your symptoms. If you have atopic eyelid eczema, symptoms typically result from an allergy. As you come into contact with an allergen, your body’s immune system creates antibodies called immunoglobulin E (IgE) to counteract the substance. This leads to a chemical reaction within your cells, which creates visible reactions, such as itching and redness. Irritant eyelid eczema happens when your eyelids or surrounding eyelid areas come into contact with an irritating substance or infection. Examples include eye cream and makeup, especially if the makeup is old and contains bacteria. 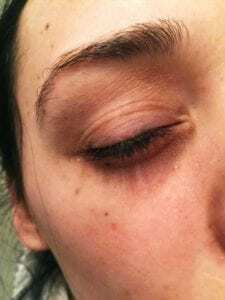 Irritant eyelid eczema may occur even if you are not allergic to any of the ingredients that are within the facial or makeup products you use. No matter which type you are impacted by, the result is very uncomfortable and itchy. Both types can be treated with self-care regimens or medication, however, you must first pinpoint your triggers when embarking on eyelid eczema treatment. Keeping a journal is a highly recommended way of easily and efficiently uncovering a sensitivity or allergen, and noting whether your eyelid eczema flares up after you put on makeup can also help. Take note of all the products you use every day and check out their ingredient lists. These products don’t just involve the eyes; they include personal care products for the hair, face, and body, such as lotion and shampoo, as well as cleansers, soap, and other products you use around the house. 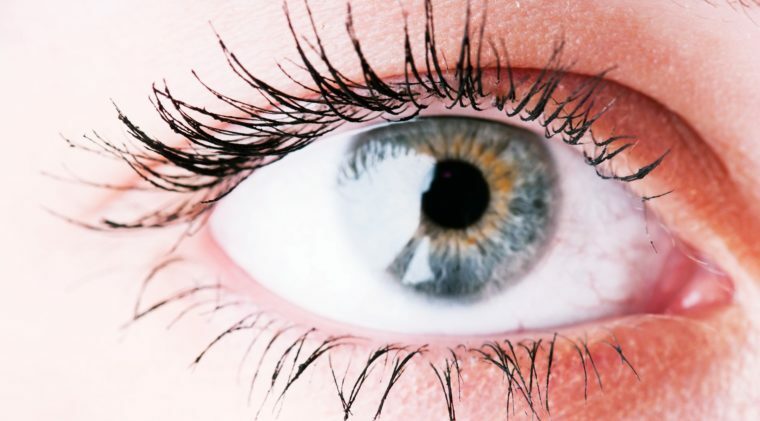 It’s possible you could be transferring an irritant to your eyes with your hands. 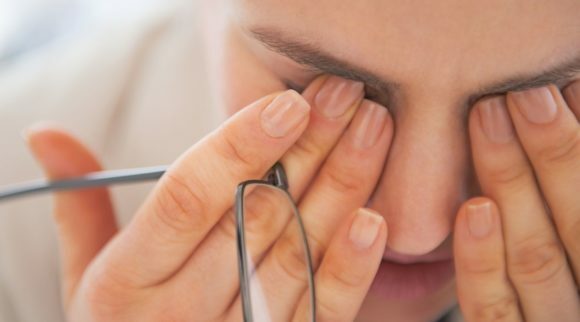 For some people, the weather, dust, looking at a computer screen for a long time, and high wind can cause symptoms of eyelid eczema. Again, each occurrence is different, and each person is different. You can also sort symptoms according to type. 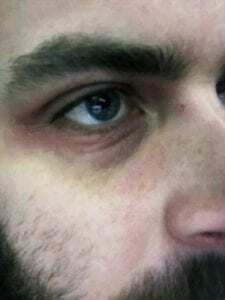 How is Eyelid Eczema Treated? 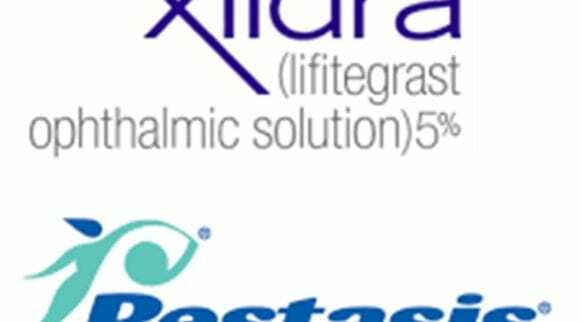 While it may be difficult living with eyelid eczema and pinpointing the cause, the good news is that eyelid eczema treatment is often effective and readily available. If you’ve identified a trigger for your symptoms, whether it’s due to allergies or to irritants, eliminating that trigger and doing what you can to not come in contact with it is your best and first method of treatment. For example, if you find your eyelid eczema flares up after you eat a certain food, it’s important that you remove that food from your diet. You may also receive a prescription from your doctor for an oral corticosteroid or short-term topical solution. This will help to reduce the itching, inflammation, and swelling. Over-the-counter topical treatments such as creams and sprays are readily available as well. It is essential to check the ingredient list to make sure the product does not contain any of your identified triggers, especially if your eyelid eczema is offset by allergies. Many products recommend that you test a sample of it against your skin first, and if any irritation occurs, to stop use. The point to these products is that they soothe your symptoms, not irritate them even more. Typically, products that are vegan, all natural, or organic are better for your skin, especially if you are applying them to your eye area. In general, it’s essential that you keep your eyelids clean and free of debris. Avoid touching your skin or rubbing and scratching your eyes. 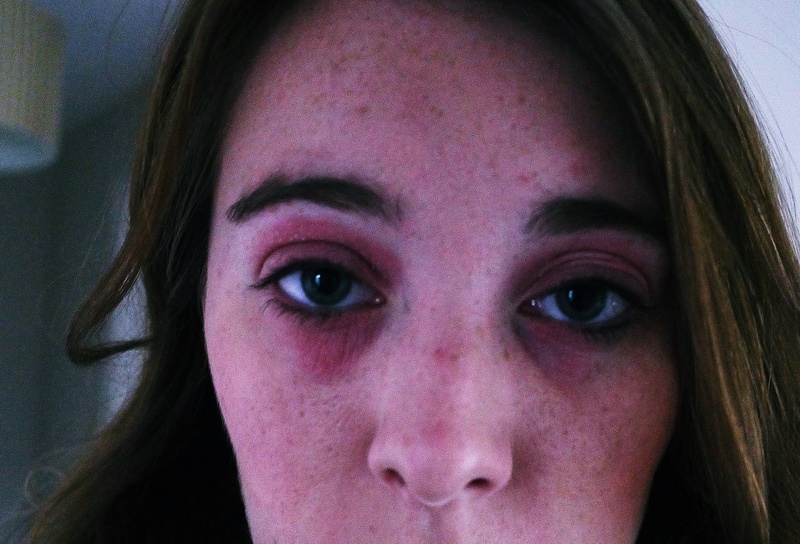 As you experience eyelid eczema, avoid makeup, eye creams, and scented cleansers. Until your condition improves, all cosmetics, including hypoallergenic ones, should be avoided. If you’re employed in a contaminated or dusty environment, it’s recommended that you wear goggles that wrap around your face entirely and ensure protection to avoid irritation to your eyelids. On top of all this, there are some at-home and self-care eyelid eczema treatments your doctor may recommend to try out. You will need to have a trial and error approach; if a treatment doesn’t seem to provide relief, or actually makes your symptoms worse, don’t continue. Everyone is different; some people find that probiotics alone will alleviate their symptoms. Putting cucumber slices on your eyes. Applying aloe vera gel to your eyelids. Leaving a cold washcloth on your eyes that has been dipped in water or milk. Applying a homemade salve that’s created from honey and plain oatmeal. A popular way to treat eyelid eczema is to apply creams, lotions, sprays, and other topical solutions to the affected area. Below are the best topical products that can help alleviate symptoms of eyelid eczema and soothe redness, irritation, and discomfort. Honeyskin brings you a solution that’s both effective and natural. 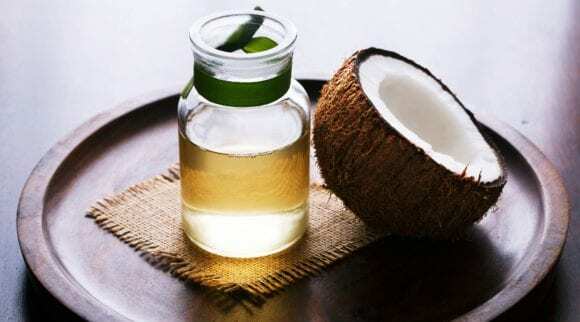 It rejuvenates and soothes the cells of your skin and is effective for pain relief and inflammation. With powerful ingredients such as manuka honey, amino acids, and vitamins and minerals, it hydrates well and restores pH levels to your skin anywhere on your body. Whether you need fast relief for various skin diseases such as eczema or you’d like to maintain your skin’s natural pH levels and keep your healthy skin radiant, this deeply-penetrating cream is your go-to. Honeyskin aims to have this ultimate, multi-purpose face and body cream be a complete solution for your skin. It works great for your body, face, and eyes, and you can soothe and calm redness, itching, or dryness as you nourish your skin with superfoods. Use it as a night cream or as a base under makeup. It’s not greasy and is unscented, so it absorbs fast and won’t further irritate your condition. You can even use it to reduce wrinkles and scars and tighten and firm skin overall. It’s gentle enough for babies as well. As an effective all-around cream, Honeyskin’s Ultimate is a popular eyelid eczema treatment. Use daily. Apply a small amount to affected area as needed or twice per day. Can be used on eyes, face, and body for women, men, and children. 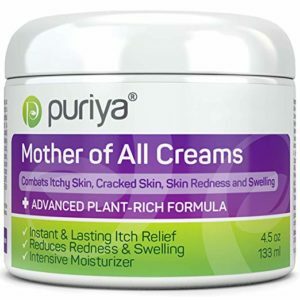 Puriya’s best-selling Mother of All Creams does what its namesake claims: it truly is an all-around cream that you can use all over your body to combat skin conditions and support your skin’s natural health and radiance. Not only does it provide fast relief from skin that’s flaky, dry, cracked, or itchy, it also actively works to reduce pain and improve the condition of your skin. It’s a soothing ointment that’s all natural and over time, gives you visibly healthier skin. It deeply hydrates and softens. No matter what condition you are suffering from, your skin is beautiful, soft, and plump again, without any residue or a greasy feel. Mother of All Creams also don’t contain any chemicals that may cause harm, and you can use it safely on the skin of your neck and face as well as your feet, scalp, and hands. You should be aware that this intensive moisturizer does come with some allergens, including plant-related allergens like peppermint oil and chamomile. Puriya’s Mildly Earthy is the allergen-free, ultra-gentle version of this cream for those who have these allergies. Mother of All Creams is also not recommended for children under the age of five or for use on skin conditions that are undiagnosed. You should test a small area to check for any allergic reactions. Apply to the affected area as needed. If you’re intending to use Mother of All Creams alongside other over-the-counter medicines or with topical prescriptions, speak with your doctor, as mixed products can lead to adverse reactions. Soothe your eyes with Eye Love’s Heyedrate Lid and Lash Cleanser. This all-organic, natural, and vegan cleanser soothes the symptoms of blepharitis, eczema, itchiness, inflammation, and can be used all over your body. It has a broad-spectrum microbial effect which not only kills microorganisms, but also prevents the formation of biofilm. It doesn’t contain any preservatives, sulfates, alcohol, or fragrance and can even be used to ease your eyes and skin after you’ve removed makeup, undergone surgery, used contacts, or been out in the sun all day. 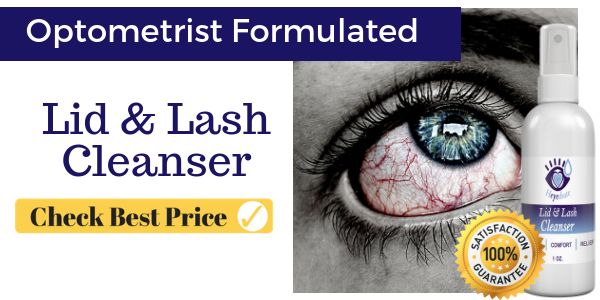 Heyedrate eyelid and eyelash cleanser is great for all ages with a fast onset of action and easy application. All you must do is clean the area you’ll be applying the cleanser to and then spray it with the solution. You won’t need to remove or rinse the cleanser. It’s also hypoallergenic and won’t irritate your skin; it’s gentle enough to soothe a wide range of skin conditions and can be used by children. With this cleanser, you can battle bacteria and infections not only on your eyelids, but everywhere on your body as well. Most effective if used every day as part of a daily skincare regimen. Clean specified area to ensure it’s free of debris or makeup, and spray one to two times with solution. If you use on your eyelids, spray onto your fingers and gently rub both the lower and upper lids and lash margins. Either let the cleanser dry or rub in. This should be repeated twice daily in the morning and the evening to achieve the best results. 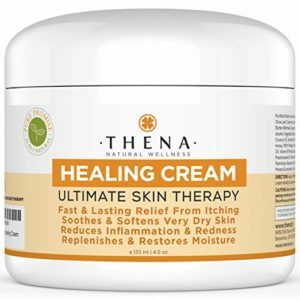 With Thena’s natural healing cream, you can prevent infections and flare ups and deal with your skin conditions directly. Natural Wellness Healing Cream deeply penetrates to protect both the surface of your skin and several layers below it, so you’re provided with results that last. Your skin will be brought back to balance as the cream restores, repairs, and rejuvenates. This cream’s plant-based formula is completely natural and contains natural oils and botanical essences that nourish, calm, and heal. You can soothe your pain and reduce inflammation without any side effects. The itching will stop instantly, and you can protect your skin against future flare ups or bacteria. It is recommended that you complete a patch test first to ensure you’re not allergic to any of the ingredients within the product. If irritation does occur, discontinue using the cream. Do not apply Natural Wellness Healing Cream to open wounds. Speak with your doctor if you are using the cream to soothe a health condition or if you are currently taking other medicine. However, Thena’s healing cream is completely safe for any skin type and is very gentle. Use it all over your body for soothing and fast relief. Apply topically as needed to the area in need of relief. For best results, use twice daily. Safe and gentle for all skin types and all over the body. 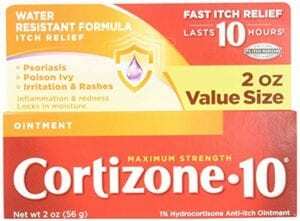 Bring fast relief to your itchy and inflamed skin with Cortizone-10’s Maximum Strength anti-itch ointment. This ointment provides fast relief if you have bug bites, rashes, psoriasis, eczema, a jewelry allergy, or dry and cracked winter skin. It can be difficult to deal with the pain and irritation if your skin is itchy, as scratching can lead to either further infection or permanent scarring. Cortizone cream is very well known when it comes to reducing redness and itchiness for fast healing and relief. Cortizone creams and ointments such as this maximum strength product utilize hydrocortisone in order to achieve this relief. This product in particular contains 1% hydrocortisone and is a staple in many people’s medicine cabinets or first aid bags for times when they run into poison ivy, bug bites, or skin condition flare ups. It’s very effective and safe to use anywhere on your body for anyone who is two years or older. Follow the instructions on the bottle to apply as directed. It is recommended to apply a small amount of product to the needed area, wait, and then apply again if needed. Do not apply the cream more than three or four times each day. For young children, consult a doctor before use. Heal your skin’s irritations and prevent future ones from occurring with this eyelid eczema treatment, Calmoseptine Ointment. This ointment is often recommended by healthcare institutions and healthcare professionals, and there’s good reason: it’s a multi-purpose moisture barrier that provides soothing relief for many skin conditions and reduces itching, redness, irritation, and discomfort. You can use it all over your body and can even apply it to treat minor scrapes or burns. Originally designed to help with infant diaper rashes, Calmoseptine has evolved to aid with many uses all over the body. With menthol and zinc oxide, this cream aids dermatitis, skin protection, itch relief, prevention of infection, allergies including reactions to poison oak and poison ivy, hives, shingles, eczema, and psoriasis. It’s an all-around product that has been in use for more than 80 years to combat many skin issues and irritations. By getting Calmoseptine, you’ll be giving your skin ingredients that many healthcare professionals have been using to help their patients. Use a mild skin cleanser to clean the affected area gently. Air dry or pat dry. Apply a thin layer of Calmoseptine Ointment to the area, no more than two to four times daily. For infants, apply after each diaper change, and for health conditions, apply after each episode. Provides long-lasting protection. 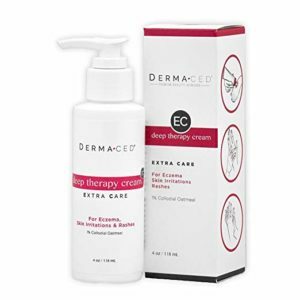 Calm your itchy skin quickly with DermaCED’s deep therapy cream. It contains colloidal oatmeal, a powerful, natural, and active soothing ingredient that has been in use for centuries to calm skin irritation and redness. The cream also contains a high amount of beta-glucan, which helps to build a barrier that holds in water and moisture to provide protection for your skin. Beta-glucan also contributes to reducing inflammation and supplements an anti-itch effect. DermaCED understands that when skin is impacted by eczema, it needs moisture (and the ability to retain that moisture) more than anything else, so the formula of this cream contains three hydration oils: sunflower oil, sweet almond oil, and jojoba seed, which also have nutrients and fatty acids. The cream is packed with other ingredients that help seal your skin and protect against future irritants, viruses, and bacteria. These include grapefruit seed, coneflower, chamomile, and cucumber fruit. Beeswax naturally seals in moisture and provides protection. Together, all these ingredients and factors make the Deep Therapy Cream an excellent cream for relief, and a further great factor is that this cream was made specifically to aid with eczema. By applying this cream, not only do you soothe your condition, but you can help prevent future flare ups as well. Apply as needed to affected area. For best results, use once in the morning and once again at night as part of a daily skincare regimen. 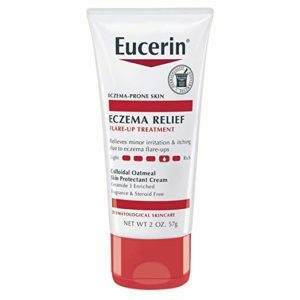 Eucerin is a well-known brand that creates skincare products and healing creams, and this Eczema Relief Flare-Up Treatment is no different as it provides immediate relief for redness and itching that comes from flare ups of eczema. The cream is fortified with colloidal oatmeal, a natural skin protectant, as well as licorice root extract and ceramide-3. As you apply, you’ll receive intense hydration that will help strengthen your skin’s natural barrier. The cream also provides a unique cooling effect that further aids in relief and a calming, soothing feeling. Eczema Relief Flare-Up is so gentle and effective, it can be used on children as young as three-months-old. With 1% colloidal oatmeal, it instantly calms, soothes, and improves the condition of skin not only on your face, but all over your body. It also contains a formula that has been clinically proven to work, and Eucerin ensures that all its products enhance, protect, and repair the health of your skin. Apply topically as needed to all affected areas. Safe for use on face and around eye area. For best results, use at least twice daily. For children younger than three months, speak with a doctor. Eyelid eczema, whether caused by irritation or by allergies, is a difficult condition to live with. Blisters, soreness, redness, inflammation, and discomfort are common symptoms of this eye condition that impacts many people. Luckily, once you determine the underlying causes, eyelid eczema treatment is typically easily and efficiently completed. You can keep a journal to determine whether your redness and irritation is caused by allergies to food or metal, high wind, a change in weather, your makeup products, cleansers you use around the house, or an ingredient in your moisturizer. 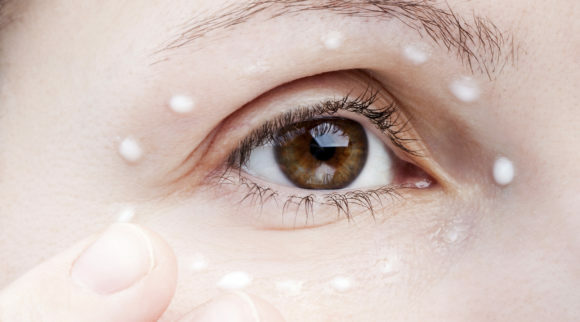 While you can get prescriptions from your doctor and try at-home treatments, many of the topical products described above are great ways to alleviate your symptoms and soothe the irritation, discomfort, itchiness, and redness of your eyelids. 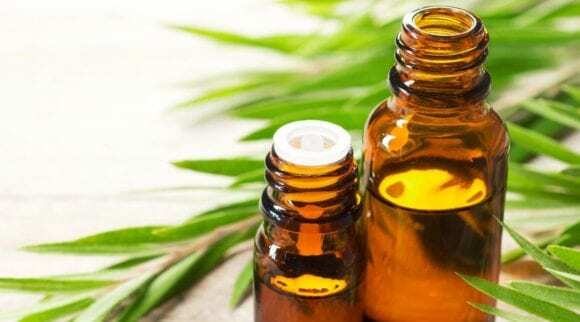 Take note of each product’s ingredients, and although all of them are perfectly safe, it’s recommended that you check in with your doctor before beginning to use them. In the end, you can find an effective treatment for yourself that you can incorporate easily into a daily health and skincare regimen.